Reaching into a refrigerator to grab a tub of yogurt from the back often means navigating an obstacle course of food items, like a 7-layer cake or a jar of pickles. One wrong move could mean squished icing or broken glass on the floor. The Easy Slide shelf of Samsung RB34 290 Litre Double Door Refrigerator is built on rolling hinges, and pulls out so you can efficiently organise and easily access your food items and readily see just what you have store in the back. 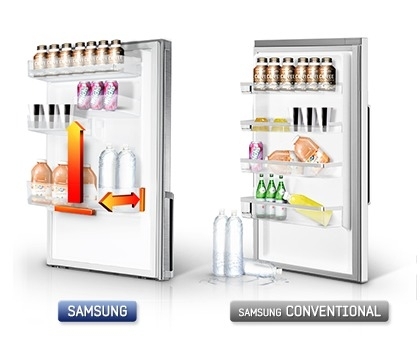 Unlike conventional compressors, which have just two patterns of start and stop, Samsung RB34 290 Litre Double Door Refrigerator’s Digital Inverter Compressor makes 5 different moving cycle based on humidity levels and usage patterns. This helps maintain a more consistent temperature, reduces wear and tear on the compressor for greater durability, and keeps noise to a minimum. You’ll also enjoy the peace of mind that comes with lower electric bills and a 10-year warranty. 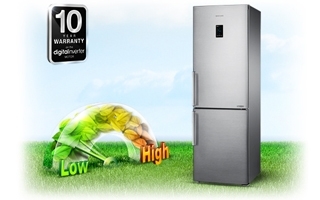 The Samsung RB34 290 Litre Double Door Refrigerator is convenient for the thirsty household, the Big Guard is deeper than shelves found in conventional refrigerators. Now you can store big containers of milk and juice in the door, along with two rows of beverage cans and bottles. Throwing a party? Use the Big Guard to chill tall bottles of water, soda, and other liquid refreshments.